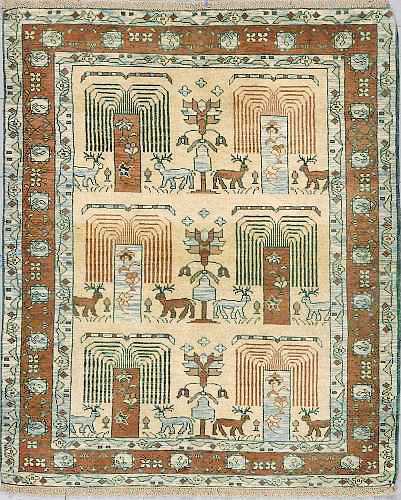 In the past, numerous handicrafts had been highly developed in Kazakhstan. Some of these declined and became practically extinct when the previously nomadic Kazakhs were settled after the October Revolution of 1917. A large number of objects, hitherto essential for yurta life in the middle of the steppe, became redundant. Nevertheless, even nowadays Kazakhstan has interesting handicrafts, and its folk artists still produce traditional objects based on the people's ideals of beauty, their folklore, and their general outlook on life. The relationship between Kazakh and Kirghiz folk arts in imagery and approach to ornamentation and design can be accounted for by the fact that the two nations have for centuries been nomadic or seminomadic. For this reason most of their crafts were connected with products from livestock raising. Women used wool and camel hair in felting, carpet-making, weav-ing, and in the making of bags for the storage and transportation of domestic utensils. Men were engaged in leathercraft, smithing, and wood and bone carving.